I am so very blessed to have some amazing Fathers in my life. My husband adores his girls and makes me fall in love with him again everyday. While my own dad, bends over backwards for his children and grandchildren. In order to thank them, the best way is straight to their bellies. 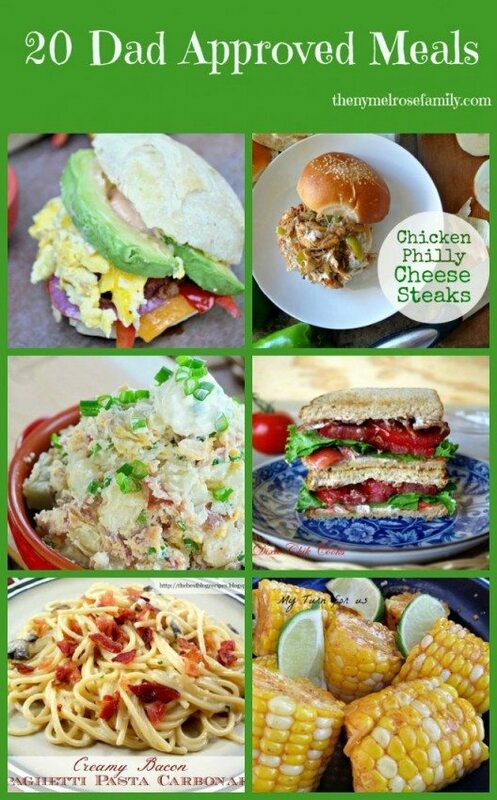 So I’ve put together 20 Dad Approved Meals to thank all the amazing Father’s out there. Just pinned!! Thanks so much for including my Chili Lime Corn in this great Line up!!! Thank you so much for featuring my Hamburger Pasta Casserole. I just pinned it!! Have a great week. Oh my, I’d say these were Mom approved, too. They look so delicious! These ideas look amazing! Thank you for including my Mock Monte Cristo! I can’t wait to check out all the other recipes! That round-up is making my mouth water! The grilled corn with goat cheese sounds amazing! Honestly, and i’m not just being bias. This is the best chicken pot pie in the world. i ain’t lyin! And if Bobby Flay is reading this, this dish deserves a throwdown and he would get throwndown. In game 6, when the Nuggets continue to double Bynum hard, the Lakers need to make them pay by having one of the other players cut towards the basket on the weak side and getting the ball to him. It won’t work every time, but it’s probably better than settling for and taking long jumpers, certainly the case for players like Barnes. Hard doubles can create holes for the other players to utilize, but I felt that the Lakers never took advantage of them. Okay – now I’m totally starving !! Great roundup! I now have some new recipes to add to the mix for our family – yay! Beautiful list, I love the Chile Lime Corn. It looks simple and nice. I would like to make it for next breakfast.